FILE - Migrants cry and walk towards Gevgelija in Macedonia after crossing Greece's border, Macedonia, Aug. 22, 2015. The United Nations Children’s Fund (UNICEF) says the number of women and children fleeing countries of violence heading for Europe has increased sharply in recent months. UNICEF says those arriving in the gateway country of the former Yugoslav Republic of Macedonia has tripled in the past three months. 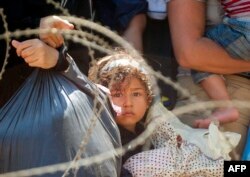 According to UNICEF, some 3,000 people arrive in Macedonia every day. It says one-third of them are women and children. Most are refugees fleeing war and persecution in their countries of origin. Eighty percent are from Syria and 10 percent from Afghanistan and Iraq. Spokesman Christophe Boulierac told VOA many families, including many children, have been on the move for weeks, even months enduring searing heat and other enormous hardships. He says many arrive at the Macedonian border with only their clothes on their backs. All are physically exhausted. “They are suffering dehydration, blisters, cold, diarrhea, and sunburn. Twelve percent of women arriving are pregnant. We got many stories of women… starting bleeding and losing their child, for instance in Greece,” Boulierac said. FILE - Migrants wait for Macedonian police to allow them to cross in Macedonia at the border line between Greece and Macedonia near the town of Gevgelija, Aug. 28, 2015. He says UNICEF is particularly concerned about the well-being of the children. “Those who left Syria, for instance, just went through a very difficult time. But, the children do not speak. And, it is not a good sign, you know. It shows a kind of trauma and some of them are clearly psycho-socially and psychologically traumatized,” he said. The refugees do not stay long in Macedonia. They are just transiting through the country on their way to the European Union where they hope to find refuge. Nevertheless, Boulierac says UNICEF is intent on easing their condition while they are in the country and particularly to bring a bit of joy into the hearts of the children. “That is why we have these child-friendly spaces, which allow them to play and to be a bit more, you know, to feel more at ease — a change of world for a few hours because they do not stay too long at that border,” he said. Since UNICEF set up the first child-friendly spaces on August 23, it has received around 1,200 children. Boulierac says the need is so huge the agency is planning to set up more play stations to accommodate ever more children who arrive in a state of distress.